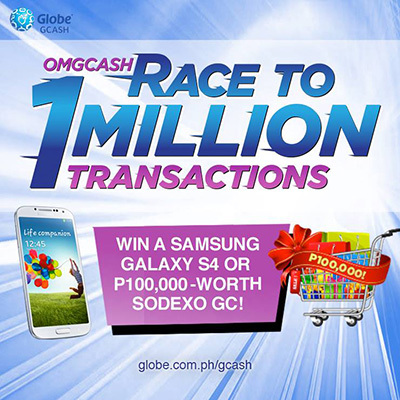 Race with other GCASH users to the 1 millionth GCASH transaction & win in the Globe OMGCASH Race to 1 Million Transactions! A Samsung Galaxy S4 will be given away for every 50,000th transaction & P100,000 Sodexo GCs await the GCASH user who made the 1 millionth GCASH transaction. Check out the live GCASH counter on www.globe.com.ph/gcash to find out the latest count! Who knows, your next GCASH transaction might win you fabulous prizes. Visit Globe Telecom Facebook page and www.globe.com.ph/gcash for more details and latest updates.